If your brand of piano is not listed in our 'Brand Name' section, please use the size chart below. To determine the size of your piano - Measure in a straight line from the farthest end at the back curve, across the closed lid to in FRONT of the keys. Sometimes it's easier to measure the entire length of the piano from underneath. For Extra protection in a Commercial setting e.g. Hotels, Theaters, Studios, Schools etc. All covers are made to order and take approximately 1-2 weeks for manufacturing. Covers can be spot cleaned with a damp cloth and mild detergent. Covers cannot be machine washed or dry cleaned. I couldn't be happier with the service and product. There were some questions with the order, and Vandaking called me promptly to clarify them. They were responsive and informative to my questions. 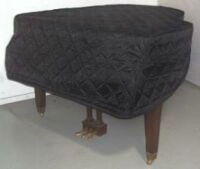 When the cover arrived it was beautiful, fit the piano perfectly and was exactly what was needed. Highly recommend this company. I love my new piano cover - it fits perfectly and came only a few days after I sent in the template and measurements. The quality is very good. I'm very happy to find a company that makes a quality product, was easy to order and delivered very quickly! I love our piano cover! The cover is a quality cover and should last for years! The company was amazing to work with and even contacted me to confirm the piano make and model before shipping! Just sorry I did not order years ago! My wife and i donated a quilted grand piano cover to our church. The instructions for measuring the piano could not have been clearer. We received the cover quicker than expected, and the fit is absolutely perfect. Thank you!